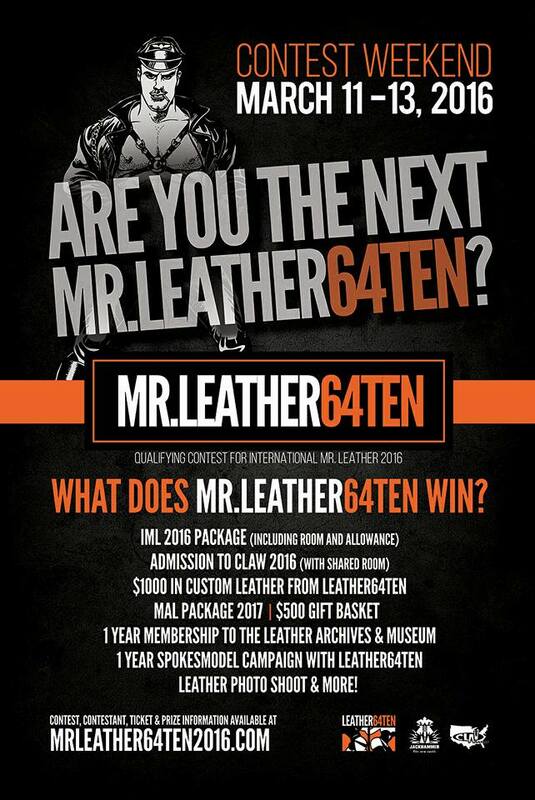 CHICAGO - Come and join the crowd as judges select a new title holder that will go on to compete at International Mister Leather in May 2016. Events will be at the Leather 64Ten store and The Jackhammer Complex. The judges for the contest are Will Boyd-Bohaczek, Mr Wisconsin Leather 2015; Justin St. Clair, 2014 International Trainer and a producer of the Illinois Puppy Contest; Tina MacKay, deputy director of CLAW 2016; Dan Ronneberg, American Leatherman 2015; and Michael Pacas, Mr. Leather 6410 2015. 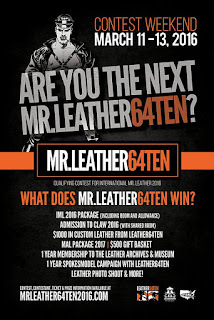 Those interested in competing for the Mr. Leather 64Ten 2016 title can pick up applications at the store, or download the application at our website, www.mrleather64ten2016.com. WINNERS PACKAGE: VALUED AT OVER $4500!!!! Advertisement in local gay papers, Leather Journal, etc. FRIDAY 03/11/16 6:00pm – 8:00pm PRE-EVENT KICKOFF PARTY Hosted by the Producers Eric and Michael, as well as the staff of Leather 64Ten. To be held in the store including light hors d’ oeuvres and champagne to start the weekend. Special discounts to be offered to the public during the party including, 15% off any leather/ fetish item in the store. Any contestant looking for last minute items can receive 35% off. SATURDAY 03/12/16 Time tbd DOGGY DAY CARE PUPPY PARTY To be held in the Sports Bar with a small suggested Kenneling fee. Hosted by Sir Justin. Held at Jackhammer Mainstage, emceed by Slade and Todd Davidson. Showcasing a performance by Lila Starr, the featured performer on the Madonna Tour and her performance with Miley Cyrus at the VMA. Keep the night going and wind down with coffee, donuts, bagels and cream cheese, hot cider and cocoa, and light refreshments (non-alcoholic event).